i came upon this sweet space belonging to blogger Rubyellen of cakies on pinterest and had to share. it’s such a whimsical, happy home space, that seems very french-inspired. and even though it’s in los angeles, it seems like a home you’d find in provence, in the south of france — eclectic, warm and very cozy. 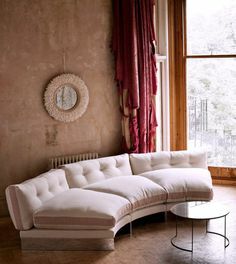 my favorite, piece de resistance is that vintage iron daybed — looks smashing with all those colorful pillows. what a wonderful mix! for the whole tour, visit cakies. • all photos via cakies. I love the decor of this house. Thank you for sharing! where is the street sign from? thanks! i’m not sure, but someone commented it was made in La Sarthe.